Klaus ‘Serratus’ Drescher was awarded with the “Sportehrennadel in Gold”! There seems to be no end to the success of Klaus these days. Another special day in his bodybuilding career was the 6th of December 2017. 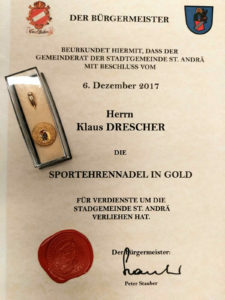 Klaus was awarded with the “Sportehrennadel in Gold” for his accomplishments, given to him by the municipality of St. Andrä (Carinthia). For Klaus this award is an especially great and unique honor. “I never thought, that a bodybuilder would receive such an award.”, he said. The photo below shows him with Peter Stauber, mayor of St. Andrä, and his wife Bernadette Stauber, which presented him with the Sportehrennadel in Gold.